THE boys were back in town on Tuesday night as two of Kingfield’s old faithful – Kevin Betsy and Giuseppe Sole – rose from the bench to get Woking back to winning ways. 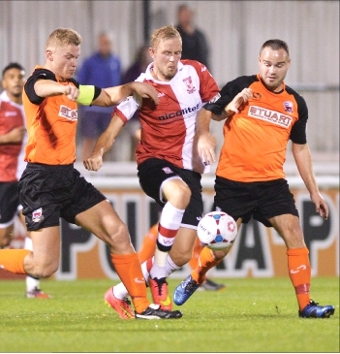 In truth Woking could and should have put Conference sleepers Nuneaton Town to bed long before Sole’s 90th minute dream of a free-kick in a game which they dominated from dawn-to-dusk. The game was like target practice at times, with the shots and corner stats going through the roof – as Betsy’s big comeback from his summer knee injury looked to inspire a halt to a hat-trick of losses prior to Tuesday night’s contest. However, through the roof is exactly where most of his team-mates’ efforts headed as they threatened to do some serious structural damage to the old ground – the Kingfield groundstaff are sure to check over the tiles of the Kingfield Road End after this pummelling. Hill’s men were ultimately grateful that Nuneaton have been profligate in front of goal themselves this season – boasting the league’s worst goals for column with a sorry six, with just a solitary strike away from their Liberty Way ground to their name. Cards’ hearts were in their mouths, though, when forward Craig Curran’s second-half header across goal dropped inches wide, with keeper Ross Worner reduced to spectator with those behind him in the Kingfield Road End. Towns’ flankers James Armson and Adam Walker both cut in but fluffed their lines with just Worner to beat – the Woking stopper pulling off a one-handed wonder save from the latter with 20 minutes left to set the stage for Sole and Betsy to bring the house down. “To score so late and keep a clean sheet after the last 10 or 12 days we’ve been through: it was a big win for us tonight,” said a relieved Woking gaffer. New Nuneaton boss Liam Daish has had a baptism of fire in his first week in the Liberty Way dugout. After Saturday’s 2-1 home loss to Dartford, he also lost his assistant manager and chairman Ian Neale – wealthy businessman Neale sensationally resigning after being arrested on assault charges at a charity fundraiser. No wonder Daish had off-field matters on his mind, but given Cards’ long-throw woes at the hands of Kidderminster in Saturday’s 3-2 loss, Daish perhaps missed a trick by releasing exotically-named long-throw specialist Exodus Geohaghon the day before the Kingfield clash. Geoff Chapple had said on radio prior to the game that, for all their neat build-up play, Woking needed ‘more pace on the shoulder of defences’ – and livewire loanees Chris Arthur and Jack Marriott were certainly standing on the shoulders of giants here. The pair were breaking through at breakneck speed at will, it was just the finishing that was wayward as Scott Rendell, John Goddard and Marriott himself sent efforts high and wide of the mark. A couple of home handball penalty shouts fell on deaf ears in the second half. Although ref Mark Pottage did point to the spot when, in his first action back, sub Betsy was hauled down by Town full-back Leon McSweeney in the box, only for the whistle-blower to spot an unseen offside flag in front of an exacerbated Moaners’ Corner. But with a tiring Nuneaton becoming increasingly lastditch in keeping out the waves of Woking attacks, ref Pottage blew up again as his watch hit 90 minutes when big Town midfielder Anton Brown went through the back of Betsy’s fellow super-sub Sole. Sole picked himself and reaped the fruits of his labour as he curled a peach of a free kick around the wall of six tangerine shirts and into the top right-hand corner. 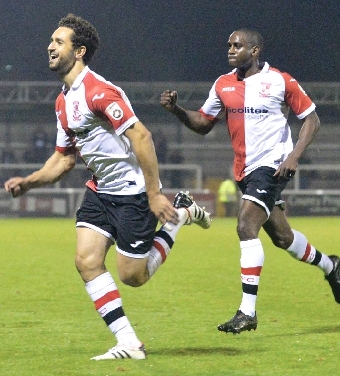 The victory lifts Woking back up to fifth in the standings, making it a very lucky opening 13 games for Hill’s men who now turn their attention to Saturday’s trip to Southport. WOKING: Worner, Cestor, McNerney, Jones, Lewis (Newton, 66mins), Arthur, Goddard, Murtagh, Morgan (Sole, 75mins), Rendell, Marriott (Betsy, 75mins).